As Spain firmly established herself in the new colony through the succeeding years, so did the Church which witnessed the creation of the Diocese of Manila. On February 6, 1579, Pope Gregory XIII issued in Rome the Papal Bull establishing the Bishopric or the Diocese of Manila, suffragan to the Archbishopric of Mexico. (A copy of this Bull is kept at the Archdiocesan Archives of Manila). The discrepancy as to the exact year of creation of the diocese – whether 1578, as indicated in the copy of the bull, or 1579 – arose because in he late 15 th century, the Julian system of reckoning days within the calendar was questioned until the Gregorian calendar was adopted. The church of Manila was raised to the rank of cathedral under the title of “Immaculate Conception of the Blessed Virgin Mary.” The cathedral was to be under a bishop who would look after the appropriate enlargement of its building and restoration into a cathedral church. In the same year, Fray Domingo de Salazar, a Dominican religious from the Convent of San Esteban in Salamanca, Spain, was presented by King Philip II of Spain to the Pope for the position of Bishop of the Diocese of Manila. A year after, in May of 1580, he left for his new assignment by way of Mexico, bringing with him thirty fellow Dominicans, many of whom died or fell ill during and after the voyage to Mexico. Only one co-religious and six other secular priests were able to accompany him to Manila where he would reign as first bishop of the diocese. Meanwhile, the Spanish monarchy was making preparations for the construction of the new cathedral in Manila. On May 13, 1579, a Royal Cedula from the Spanish king mandated the governor general of the Philippines to construct a moderately ample cathedral on a convenient site, the expenses of which were to be divided among the natives, Royal Treasury, and the encomenderos. Another Royal Cedula of the same date ordered the Casa de Contratacion or Office of Contracts and Agreements to give the city of Manila 15 ducats, worth 187,000 maravedis, intended for ornaments, chalices, and other essentials which the cathedral would require. On May 22, 1579, part of the tithes belonging to the king during a period of ten years was given for the construction of the Manila Cathedral. With such amount and support, the construction of the cathedral began. This support from the monarchy continued until the 18 th century when the cathedral, a victim of natural disasters and time, underwent repairs and reconstructions. 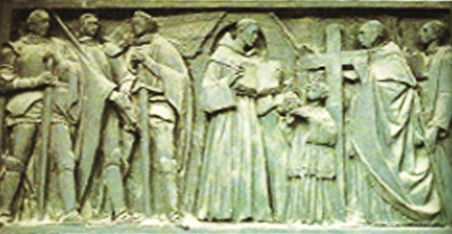 Bishop Domingo de Salazar and his surviving companions, the Dominican Fray Cristobal de Salvatierra and six secular priests – Diego Vasquez de Mercado, Martin de Ribera, Francisco de Morales, Geronimo Vasquez, Santiago de Castro, and Francisco de Pareja – left Acapulco on March 29, 1581 aboard the galleon San Martin. They were accompanied by six Franciscan friars under Fr. Antonio de Villanueva, a good number of Augustinians under Fr. Juan Pimentel, and three Jesuits with their rector Fr. Antonio Sedeño. In August of 1581, they finally reached the Ladrones islands, and days after reached Samar and then the Bicol peninsula where the San Martin took refuge in the bay of Ibalon due to very bad weather. From there, Salazar went by land crossing the Bicol area and reached Laguna de Bay after trekking the Sierra Madre mountains. By boat, he finally reached Manila by way of the river Pasig on September 17, 1581. On September 21, 1581, with full pontifical and royal authority, Bishop Salazar created the act to erect and found the new Cathedral of Manila under the advocation of the Immaculate Conception, the original titular patroness of the old parochial church. He then proceeded to build a cathedral to replace the old parish church. The first Cathedral of Manila was constructed by Fray Bishop Domingo de Salazar out of wood, bamboo, and nipa – materials which were used in all houses and other basic community services in the city. It was on December 21, 1581 that the parish church of Manila was raised formally into a cathedral. As Bishop of Manila, Salazar possessed the exclusive right to erect and establish dignities, canonries, prebends, and other ecclesiastical benefices. He created the positions of dean, archdeacon, chanter, school master, treasurer, ten canonries and prebends, six whole portiones (raciones), and six half portiones (medios raciones), rectors, six acolytes, six chaplains, sacristan, organist, beadle, econome, chancellor or notary of the church chapter, and dog catcher. However, the initial state of incomes and revenues of the cathedral was not sufficient to support the entire number of positions created. Thus, only the first five dignitaries, ten canonries, and six whole and six half portiones were declared established for the service of the cathedral. It was also resolved that the cleric of the church and diocese with the first tonsure should enjoy his privilege. He should carry the clerical tonsure the size of one silver real. The hair at the back of his head should be worn clipped with scissors two fingers’ breadth below the ears. He should go about decently dressed with a cloak or mantilla which must not be of red or yellow but of a more somber color. When the cathedral was erected, Bishop Salazar created four prebends: Don Diego Vasquez de Mercado as dean, Don Francisco de Morales as precentor, and Don Francisco de Pareja and Don Gonzalo del Castillo as canons. Diego Vasquez de Mercado later became the Bishop of Yucatan and the fourth Archbishop of Manila. In 1583, Don Juan de Vivero was appointed as its first treasurer and later, in 1585, was promoted as its first archdeacon. Its first school master was Gabriel de la Cruz appointed in 1583. Under Bishop Domingo de Salazar, the first synod of Manila was held in 1582 where 90 ecclesiastical and religious persons and six captains or heads, who were the oldest and most eminent, attended. The sessions lasted until 1586 holding a duration of four years. The Sinodo de Manila of 1582 was the first synod ever held in the Philippines. In it, matters relating to the governance of the new colonial territory were discussed. Among the subjects deliberated upon were the teaching of catechism in the native dialect and the declaration of human rights of both native Christians and non-Christians. The Cathedral church was destroyed in 1583 by a fire which razed the city. During the funeral mass for Governor General Gonzalo Ronquillo de Peñalosa at San Agustin Church, a candle fell on the catafalque, burning it and the church. The flames spread all over Manila, destroying many houses and structures of the same simple materials. Along with the Cathedral of Manila, the Bishop’s palace was destroyed including all important church papers and records, and the proceedings of the first Synod held in the Philippines. The cathedral was rebuilt using the same materials of nipa, bamboo, and wood. On January 20, 1587, the Spanish monarch issued a royal decree ordering the Governor General Santiago de Vera to construct a new edifice for the cathedral. However, the simple structure then constructed lasted only until June 15, 1588 when a hurricane destroyed it with the majority of the houses in Manila. On June 31, 1588, a letter from the city of Manila provided for 3,000 pesos, divided among the local residents, the natives and the Real Hacienda, to be spent for the wall foundations of the cathedral church which, by that time, were already 2 brazas in height. Although this sum was considered insufficient to bring the walls to the necessary height, it was a welcome support. Meantime, Gomez Perez Dasmariñas was appointed the new governor of the colony. Upon his arrival in the islands in May of 1590, Dasmariñas immediately set upon to fulfill the orders of the letter. He divided 12,000 ducats in three parts, as was the custom, at the rate of 3,000 annuities for a period of four years. Upon passing by Nueva España, as he was ordered, he obtained 2,000 ducats from the Royal Treasury there as advance contribution of the Real Hacienda. With such capital, the construction of a stone cathedral was to take effect.